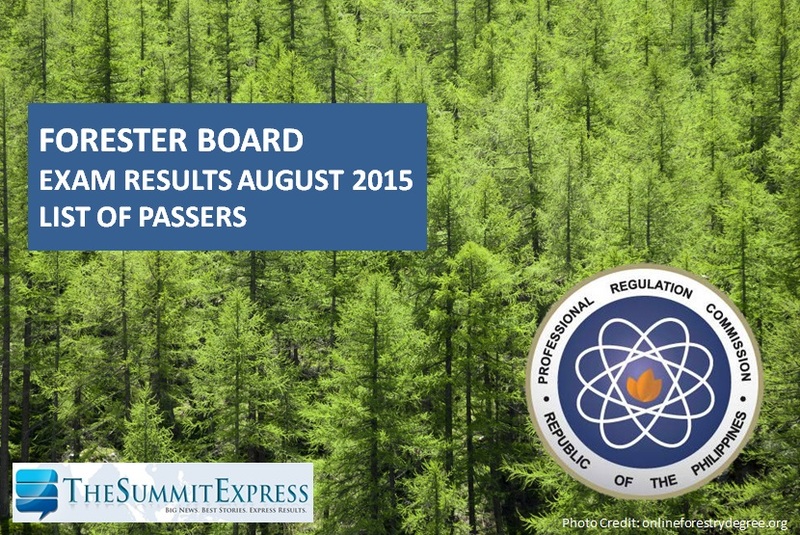 Those awaiting results of August 2015 Forester board exam can find here the complete list of passers, top 10 (topnotchers), top performing school and performance of schools as the Professional Regulation Commission (PRC) and the Board for Foresters released results in 2 working days after the last day of exam. PRC on Wednesday announced that 461 out of 961 passed the Forester Licensure Examination. PRC administered the Forester board exam in Manila and Davao on Sunday and Monday, August 2-3, 2015. The August 2015 Forester board exam covered the following major subjects: forest ecosystem, forest governance and social forestry (Day 1) and forest utilization engineering and forest production and management (Day 2). Like Us on Facebook or Follow Us on Twitter to receive more updates. You may subscribe also on our RSS Feeds.